For the past few weeks, every night when I’ve washed my face at bedtime, I’ve glanced over at my makeup brushes and made a mental footnote to wash them. Oh and treat myself to a new makeup bag. Except (cringe), I still haven’t washed them nor have I purchased a new bag. Life is busy with two little ones and often small tasks – like washing makeup brushes – seem to fall to the wayside. Good intentions always remain, and yet I can’t seem to remember to give those beautiful brushes the bath they deserve. We shower and wash our faces, so why do we procrastinate cleaning the tools that help to enhance our natural beauty? As I applied my evening skin care routine last night, it occurred to me that, gasp, unclean brushes could be filled with bacteria and contribute to pesky breakouts. Despite dustings of pink blush, creamy foundation and graphite colored eyeshadow, the brushes look clean and still do their jobs, and yet I know what is lurking under those bristles. I’m a bit of a germaphobe and so this concept alone served as motivation to change my ways! I did a bit of research, and learned that (no surprise!) brushes collect leftover makeup, bacteria, dead skin, oil and dust and if they haven’t been washed, you are applying this right back on to your face – yuck! Also, great quality brushes can be pricey, and so by regularly washing them you can extend the life of the brush. And so, I set out to get smart on the ins and outs of washing make up brushes and of course share my findings with you. Enjoy and cheers to the week ahead! 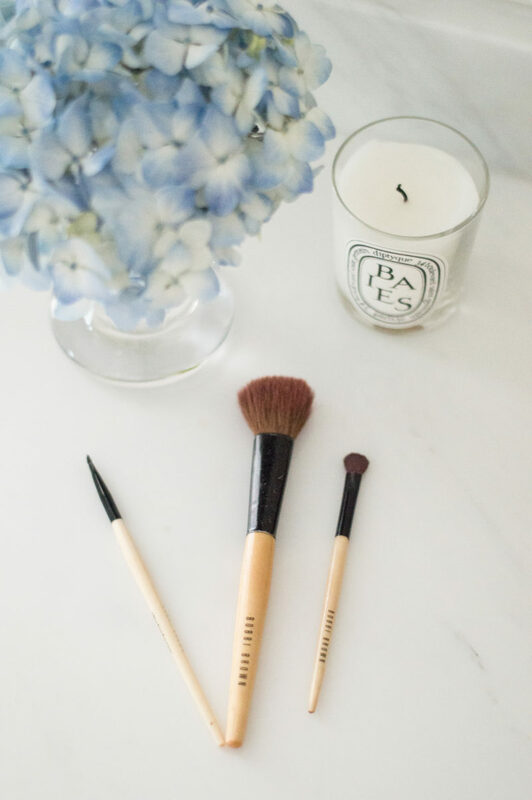 Ideally, wash your brushes once a week, to help remove build-up, and think of it as another step to your beauty ritual. Sunday is a nice day to give your brushes a good cleansing, as it will ensure everything is fresh for the week ahead. Not to mention it’s so easy peasy and takes a matter of minutes! First, rinse the brush tip under some warm running water. Be sure to only wash the actual brush bristles and not the handle or neck of brush, as water can break down the glue that holds the bristles and brush together. Next, place a generous drop of shampoo into the palm of your hand (and a drop of tea tree oil if you choose), and gently twirl the brush tip to create a nice bubbly lather. Rinse the brush under clean running water until the water runs clear. You might need to do two applications of shampoo for very dirty brushes, and again, rinse the soapy brushes until the water is clear. Using the cloth, gently dry the brushes. Lay the brushes flat to dry on the counter.